To say our solar system is fascinating place would be a gross understatement; a place of gas giants, frozen worlds, vast alien landscapes and geological wonders on a scale that simply boggle the mind. 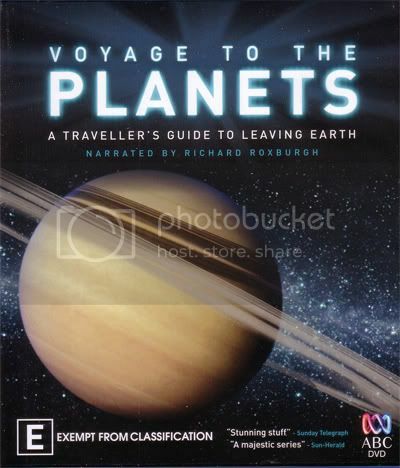 This six-part documentary series narrated by Richard Roxburgh takes you from the safety of our blue planet know as Earth on guide tour of our solar system and many mysterious wonders that lie within. So prepare for a voyage to the planets. I’ve seen quite a few documentary series on the planets and the universe in general. This series is one of the best I’ve seen. I put it right up there next to Space with Sam Neill. It’s beautifully presented, and looks stunning in full high definition. Richard Roxburgh provides great narration and the music which is mixed in the theme from Once Upon a time in the West works perfectly. And it’s the first series I’ve seen that really goes into detail explaining why Pluto was declassified as a planet. If you decide to watch this, watch it on Blu-ray or you’ll be really missing out on something special.